BLOOMINGTON — Lights flashed on the 4-foot robot and the text "Jason Phillips arriving" appeared on the video screen near the top of the robot. Then, the smiling face of a 9-year-old boy appeared on the screen. "Hey, Jason," his fourth-grade teacher, Deb Weaver, said as Jason's excited classmates called out their greetings. 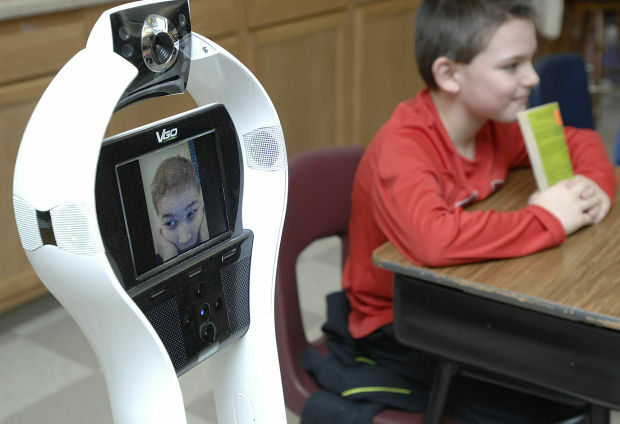 Then the robot on wheels — which looks like a Segway base with lights, a screen, a camera and microphone — made its way around the classroom with Jason and classmates greeting each other. "I'll have you be a shoulder buddy with Tyler and then we'll get started on our new book," Weaver said. "Jason the Robot" made his way through the classroom beside Tyler Moore and reading class settled into a discussion of 1768 New England, the time and setting for the book, "The Sign of the Beaver." "Jason the Robot" at Trinity Lutheran School, 1102 W. Hamilton Road, Bloomington, was being operated by Jason Phillips more than 400 miles away in the Ronald McDonald House in Memphis, Tenn. Jason, a Trinity Lutheran fourth-grader, is a patient at St. Jude Children's Research Hospital in Memphis, where is he being treated for a rare and aggressive cancer. 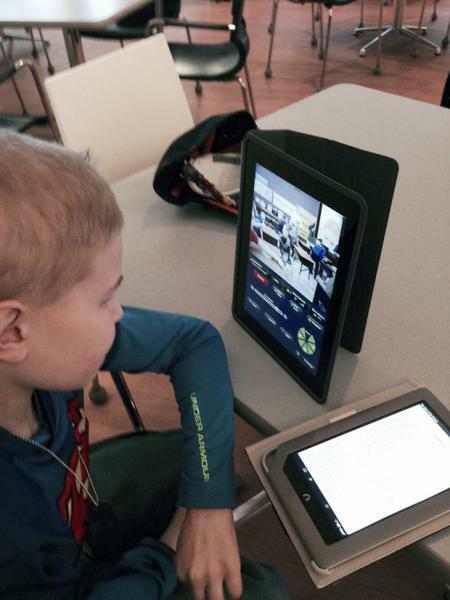 Jason connected to the class between a chemotherapy treatment and doctor's appointment using the robot, called a VGo. During class, he was able to move the VGo and adjust the tilt and zoom of the camera to better see and hear classroom discussion. At Ronald McDonald House, Jason controlled the VGo using an iPad keypad and was able to see on the iPad the part of the classroom facing the camera. A couple of times, he asked soft-spoken classmates to repeat answers that he couldn't hear. Despite VGo's imperfections, its ability to allow Jason to connect with classes from time to time isn't lost even on the tech-savvy younger generation. "It's crazy what technology can do today," said Tyler, 10. "He can control that robot from Tennessee!" But concern for Jason outweighs excitement over technology. "It's not the same," Tyler said. "He can't be there all the time. We're hoping he gets better." Meanwhile, VGo — along with lesson plans that Weaver shares with St. Jude teachers — is helping to keep Jason as academically, socially and spiritually connected as possible while he continues chemotherapy. "It's amazing," his mother, Kim Phillips, said from Ronald McDonald House, where she's living with Jason. "It can be fun," Jason said. "Sometimes it freezes, and then it's hard, but usually it works good." The Phillips family — Kim, her husband Nick and their children, Jason and Jacob, 13 — live in rural DeWitt. Kim and Nick work for State Farm in Bloomington. Jacob is a seventh-grader at Clinton Junior High School. "Before he experienced symptoms, Jason was super healthy," his mother said. "He never missed school." In November, Jason began experiencing stomach pain. "There'd be some aching after I'd eat," Jason recalled. "I think it was the pressure of the tumor." When his abdomen felt hard and appeared to swell, his parents took Jason to his pediatrician, who sent Jason to OSF St. Joseph Medical Center for tests. From there, he was sent to Children's Hospital of Illinois in Peoria, where a biopsy was performed on Nov. 19. The diagnosis was desmoplastic small round cell tumor (DSRCT), a rare cancer found in the abdomen. According to St. Jude, fewer than 200 cases have been reported, mostly in boys and young men. "I was kind of scared," Jason admitted. "We cried and prayed," his mother said. "We learned that this is one of those quirky cancers. It's not hereditary. It's not caused by any environmental thing. It happens within the chromosomes and there's nothing we could have done to prevent it." The bad news is that the cancer is so rare that no standard treatment has been developed. The good news for Jason is that the cancer hadn't spread to any other organs. St. Jude has a clinical trial testing new chemo drugs for patients newly diagnosed with DSRCT. Jason was taken by ambulance to St. Jude, enrolled in the study, began chemo and experienced its side effects, including vomiting, diarrhea, severe stomach cramps and mouth sores. After six weeks, new scans found that the two largest tumors — which each had been the size of a cantaloupe — had shrunk by 40 percent. Now Jason is in the middle of a second, 12-week chemo cycle. "He is doing really well," Kim said. "He's not experiencing many side effects and he's lost just a little bit of hair." That doesn't mean it's been easy on the tight-knit Phillips family. Kim and Nick have switched off staying with Jason in Memphis and with Jacob back home. A friend of Kim's who works at State Farm mentioned that State Farm had a VGo that it was retiring. The friend contacted Trinity Lutheran Principal Shawn Hoffmann and State Farm donated the VGo hardware and its charging station to Trinity Lutheran on Jan. 12. "I was just blown away from their generosity," Hoffmann said. 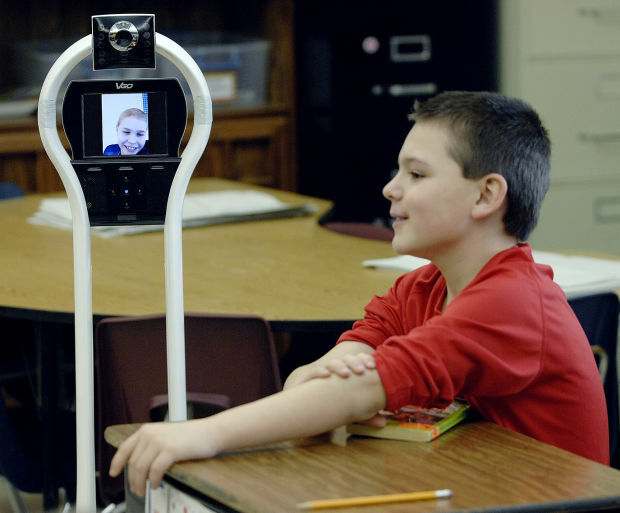 The school spent $1,200 for a one-year VGo subscription to allow Jason to use the robot, starting Jan. 22. "It wasn't too hard to get used to because it's similar to video games on a phone," Jason said. "I think it's really cool because most of the time I'm down here, I don't see much of my family." "Not only is there the academic connection (Jason even was able to join a science experiment in which he told a classmate what to do on his behalf), but there is the social and spiritual interaction, which Jason thrives on," Hoffmann said. Jason, via his VGo, joined a Lutheran Schools' Week assembly in the multipurpose room. Jason uses the VGo about three times a week between chemotherapy, doctor visits and meeting with the St. Jude teacher. Hoffmann and Weaver said it's gone well overall and they wish Jason could use VGo more often. "But there are times that he's hurting. Sometimes, after five minutes he's wiped out. We can't forget that the No. 1 thing for him is his healing," Hoffmann said. The goal of chemo is to shrink the large tumors enough so that surgically removing them is possible. Microscopic tumors then would be removed by hot, liquid chemo circulated around the abdomen and radiation. "Maybe in another six months, we can go home," Kim said. "We are taking it one day at a time." Meanwhile, "he is not isolated," Hoffmann said. "VGo is providing a bridge" — for Jason and his classmates. After 30 minutes of reading class, Jason needed to leave for a doctor's appointment. He waved to his classmates and drove his VGo to its docking station before signing off. "Bye, Jason," Weaver said. "We're praying for you."